Demand for doctor-assisted suicide isn't about dying, it's about disability, the director of a Quebec disability rights organization told a national anti-euthanasia symposium in Toronto Nov. 8. "The popular support (for assisted suicide) is rooted in disability discrimination. It's rooted in the idea that life with a disability is a fate worse than death," Amy Hasbrouck told The Catholic Register during a break at the Euthanasia Symposium 2013 in Toronto. A video Toronto microbiologist Dr. Donald Low made eight days before he died of cancer has reignited calls to strike down laws against assisted suicide. But the seven-minute YouTube video from the man who guided Toronto through the 2003 SARS crisis barely mentions death, said Hasbrouck. "In the video Dr. Low produced before he died he talked about the things he was afraid of," said Hasbrouck of Toujours Vivant - Not Dead Yet. "But most of those things related to disability and not death. He talked about his fear of having to be carried from the bed to the bathroom. That's a disability issue, it's not a dying issue. He talked about his fear of having to use a feeding tube. Well, people with disabilities use feeding tubes every day. You just deal with it, but it's not a fate worse than death." If Canada passes laws to enable doctors to kill patients who fear needing assistance and struggling with limitations the country will have decided we are all better off dead than disabled, Hasbrouck argues. "People with disabilities have traditionally been ignored in our society, not treated as equals on an intellectual and social basis," she said. "It's been very difficult for us to participate in this debate, even though the debate is completely fixed on our lives." Where society supports suicide prevention hotlines to prevent able-bodied people from killing themselves, they are now convinced that disabled people should be offered a suicide option in the guise of medical treatment, argues Hasbrouck. Toujours Vivant - Not Dead Yet predicts that the proposed Quebec law which would redefine doctor-assisted suicide as a medical procedure, circumventing Criminal Code of Canada laws against assisting another person to kill themselves, will pass. Quebec's National Assembly voted the bill through second reading Oct. 28. Toujours Vivant - Not Dead Yet is now focused on trying to mitigate the damage, first by challenging the law in courts and then by lobbying for strict regulations before implementing the law. But the issue and the debate are not just a Quebec concern. "It's absolutely something of concern to the rest of Canada," she said. "The details of the legislation aren't that important. The fact is there is a huge push everywhere for this kind of thing." People who see the dangers in reclassifying deliberate killing as medical care need to pay more attention to the issue of disability, Hasbrouck said. 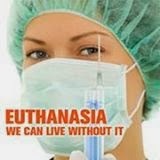 The anti-euthanasia movement is currently a coalition of religious, right-to-life and disability rights organizations. However, religious arguments gain little traction and abortion-related arguments and organizations are deeply polarizing. Canadians are hearing too little of the disability rights arguments, said Hasbrouck. "Because of the changing influence of religion in our society today, the arguments related to disability rights and policy arguments are much stronger now and are more effective with the general public than the religious arguments," she said. Laws which permit doctors to end the lives of people who are distressed by the prospect of disability will effectively devalue the lives of all disabled people, said Hasbrouck. Arguing for the equal rights of disabled people makes it less possible for pro-euthanasia advocates to portray all those who disagree as hardline ideologues and religious fundamentalists. Symposia like the Toronto event bringing together all sides of the anti-euthanasia movement are an important opportunity to sharpen arguments against assisted suicide, Hasbrouck said. "We get isolated in our little bubbles," she said. "We need to know what messages work and which don't work."